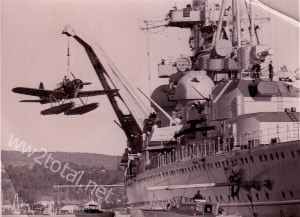 Never before published WW2 pictures: the photographs were taken from the grandfather of the author of this website in Germany, during the sea transports, in Norway, Estonia and Poland while serving in the German Wehrmacht from 1939 to 1945. 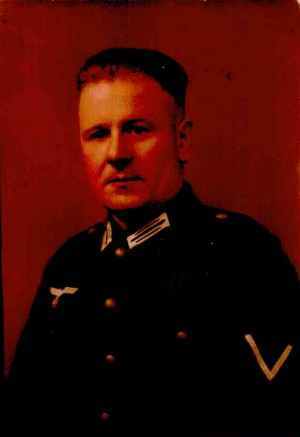 Willi Helmas served in the 214th Infantry Division (military district IX, Kassel), which was formed on 26th August 1939 as a division of the 3rd wave by Landwehr (Home Guard) commander Theodor Groppe. Replacements came from the Reserve infantry battalion No.367 in Hanau near Frankfurt, where his residence was. Since he had its own motorcycle with sidecar, he was conscripted together with it as a Kradschütze (motor-cycle troops) and messenger. Since he was an automobile mechanic in his civilian occupation, he first did service in the repairing unit of the 214th Infantry division. In the last year of WW2, at the Eastern front, he also had to serve as a front line soldier and as a motorcycle messenger. From September 1939 to January 1940 the 214th Infantry division was an element of the 1st Army of the Army Group C, which was located at the so-called Westwall (Siegfried Line) in the Saarpfalz at the border to France. Probably, because of political unreliability (website in German language: orders for the soldiers by the division commander to prevent excesses against Jews by force of arms, resistance against SS orders and conflict with Himmler) the division was removed from there and the commander General replaced (later retired dishonorable, after the July coup of 1944 arrested and death sentence in April 1945). In April 1940, the division participated in the Unternehmen Weserübung ( Operation Weser Crossing) and landed at Kristiansand in Norway. Later on, the task of the divison was to guard the coast line near Sorlandet. In January 1941 the division was relocated to Adger (Rogaland) near Stavanger in western Norway. During 1942 and 1943 up to 2/3 of the division were with the 20th Mountain Army in Lapland (northern Norway and Finland). Due to the critical situation in the northern sector of the Eastern front, where the Russians had broken the German siege ring around Leningrad, it was ordered in January 1944 to reorganize the 214th Infantry Division for the use at the Eastern Front. The division arrived in the front line at the river Narva (border between Estonia and Russia) in March 1944. Shortly afterwards, the situation in Galicia became also worse. So, in April 1944 the division was moved to the 4th Panzer Army of the Army Group North Ukraine at Kovel. Until August 1944 the German front was back at the Vistula. Until October the Russians crossed the Vistula and the soldiers found themselves at the Russian Baranov bridgehead. This exposed position was defended until January 1945. In the following great Russian winter offensive the 214th Infantry division was in the center of the Russian attack during the Battle at the Vistula (12th to 15th January 1945). The division was surpassed on both sides and destroyed. 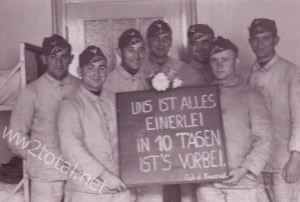 They don’t care – German soldiers happy to be released from Wehrmacht in 10 days. Only a few soldiers escaped and were formed in a battalion in Silesia under Army Group Center, from which the division should have been rebuild. But the war was over before this could be done. On 30th April 1945 my grandfather fell in hands of soldiers of the 2nd Polish Army and became prisoner of war, only eleven days before, last of all, Army Group Center (field marshal Schörner: after WW2 arrested and charged with the illegal executions of German Army soldiers accused of desertion) surrendered in Bohemia and WW2 in Europe was over. He came back in July 1947.